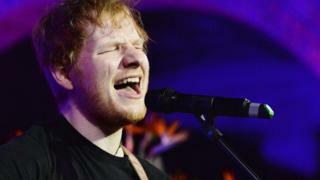 Image caption Ed Sheeran: "I think this year is going to be the high point of my career"
In the first part of our exclusive interview with Ed Sheeran, the singer talked about writing 10 different versions of his third album, ÷ (Divide), and revealed he had a song "better than Thinking Out Loud". In this, the second part, we delve deeper, using ÷ (Divide)'s song titles as the jumping off point for a series of random, but revealing questions. So, if you want to know how he burned his foot on a volcano, what he bought his girlfriend for Christmas, or when Taylor Swift's new album is coming out, read on. You erased yourself from social media last year. Was that for peace of mind? My mind was definitely more settled. I didn't have as much anxiety, because I didn't have as many people wanting things from me. Or I wasn't aware of the people who wanted things from me. Also, I started having conversations with people, rather than just going into my phone. Is it true you got rid of your phone completely? I don't have one at all. It's amazing. I was at a house party the other day and 50% of the people were either Snapchatting or watching Snapchat. Someone said: "Why don't you have a phone any more?" and I was like: "Look around you. This is exactly why I don't have a phone." Now that you can afford to live in a castle, how do you make your songs relatable to fans? It doesn't matter how relevant they are. My song Don't isn't very relevant to my fans. They aren't going to "four cities on two planes on the same day". But the truth of the song is the frustration and anger [of being cheated on]. Everyone can relate to that. So the key is truth. Just be honest. On your last album, you sang about watching Blue Planet. Did you catch Planet Earth II? I was a massive fan of Planet Earth II. I was actually saying we should put David Attenborough in bubble wrap for 2017, because we can't lose another legend. Whose death affected you most last year? The George Michael thing really took me by surprise, because he was so young. He's younger than my dad. I had a party for New Year, and people played George Michael tunes the whole night. It was amazing to see how many people were made happy by his music. He really did affect a lot of people in a positive way, and it's just so, so sad for someone like that to go so young. 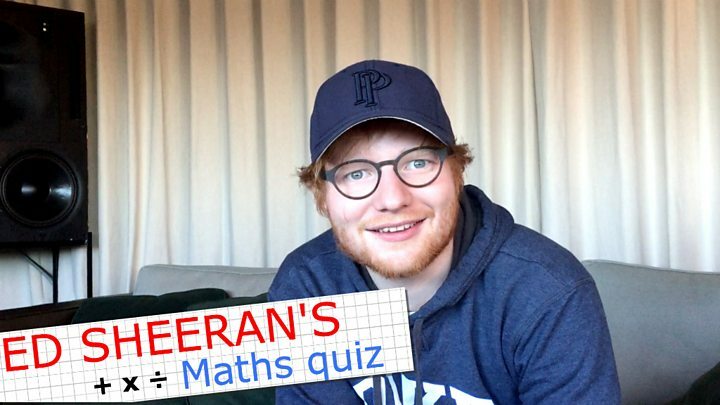 Media captionHis albums are called +, x and ÷ but how good is Ed Sheeran at maths? You burst your eardrum diving off a yacht two years ago. Were you worried it would affect your career? Well, I was born without an eardrum in that ear. I got it replaced when I was 11, then I burst it when I was 18 and again I was 24. It's actually quite a common thing, so I wasn't worried. I only have about 25% hearing in that ear anyway. What are the best and worst diet tips you've been given? I was hanging out with a model ages ago, and she used to dip cotton wool balls in diet Pepsi and that would be her meal for the day. That's a bad diet tip. The best tip is to eat what you want and exercise every day. It doesn't have to be a lot of exercise. Just keep your metabolism up. Beer is my biggest poison because beer puts on the most weight, and I can really guzzle beer. But now I tend to have one beer then move to spirits, rather than drinking beer all night. Is that better for hangovers? Well, my hangovers are quite bad. I find if you smoke cigarettes, your hangovers are horrendous. A friend of mine swears you can avoid a hangover by drinking two cups of tea before you go to bed. Yeah. I've been told to down a pint of water before you go to bed, and then you'll feel fine. Apparently, flat Sprite in the morning is a good cure too. What is the perfect song? Something that makes you feel - whether it be happy or sad or whatever. I heard George Benson's Give Me The Night the other day, and it just made me smile and want to dance. The best songs of last year are the ones that came on the radio and you're like: "Yes, yeah." You never want to hear a song that makes you go: "Nyeh, that's all right." Galway's called the "city of tribes". What's your tribe? Suffolk folk - we're quite easy going, we all own bicycles and we like our ale. Is that song a cover of the Steve Earle classic? No, it's an original. I actually tried to find another lyric. I did Wexford Girl and Clonakity Girl and Cork Girl... none of them worked. But the whole point of folk songs is taking inspiration from the past and making something new - so people will just have to deal with it. 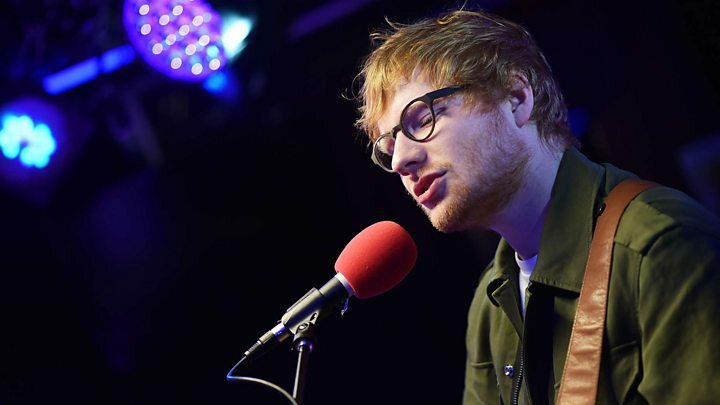 Image caption Ed Sheeran's cats: "I'll give them medicine, then they'll cough it up in my hand. That's quite cute, actually." What's currently making you happy? Or sad, for that matter. I'll tell you what's making me happy-sad: my cats. They've got flu, but they're just really cute. When they sneeze, that's a happy-sadness. It's like "Aah," but also "Ugh." I put my foot in a boiling pool of water when I was up a volcano. That was pretty bad... but when you asked that, my hand started twitching - so maybe it's that. I smashed a bottle of beer into my hand and got 12 stitches before a gig. Then I played the gig and split them open again while playing. It almost hit a tendon and meant I wouldn't be able to use this hand to play guitar. So, yeah, that was the worst injury I've had. I'm actually getting a bit twitchy thinking about it. Have you ever advised a girl to dump her boyfriend because you had a crush on her? Probably, when I was 14. Not since then. Not when it's been a serious relationship. Because I don't really have much else to offer. I can't be like: "You should leave your boyfriend," and then disappear off on tour for four years. Given your lyrics, do people think you're wise romantically? Do they ask for advice? I'm great at advice, yeah. I give the best advice. I just won't always follow it. Yeah, all of it. At the beginning I got a bit upset, but you can't sell 22 million albums, then read a review by one person and be like: "No-one likes me." But I used to have a hit list. I remembered the people who didn't help, and then if they asked: "Do you want to go on the cover of our magazine?" I'd be like: "Hell, no." The list doesn't really exist any more. It was just in the very early stage of my career. Track 11: How Would You Feel? What's been the high point of the past five years? I think this year is going to be the high point. I have a feeling about it. Seventeen is my lucky number, and everyone I was scared of releasing of albums around me released them all last year - people like Beyonce and The Weekend and Bruno Mars. Taylor [Swift] isn't going to be releasing until probably the end of this year - Christmas is the smartest time to release because that's when everyone buys records. So I've got a full year of just all Ed, all the time. What's the least romantic present you've ever bought? I bought my girlfriend a penknife for Christmas. Not romantic, but she wanted one. I got her a penknife, and she got me a Tech Deck - you know, those finger-sized skateboards you used to play with in school? So you listened to what she wanted and bought her it? That's the definition of romantic. OK. Do you know what? I was watching the Bridget Jones movie, and they had that new Dyson hairdryer advert - and all the girls around me, all these mums and daughters, were going, "Oh, that looks great." So I was like: "[clicks fingers] Sorted for Christmas." So that's probably the least romantic sentiment. Ed Sheeran's new album, ÷ (Divide), is released on Friday, 3 March, by Atlantic Records.